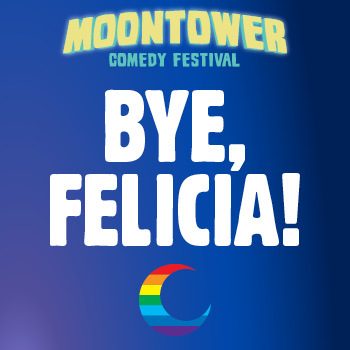 Home » Moontower Comedy » Schedule » Bye Felicia! This power-packed celebration of LGBTQ comedy pride is stacked with the hottest comedians today: Solomon Georgio (Conan, Comedy Central), Sam Jay (SNL, Netflix), Julio Torres (The Tonight Show, SNL) Erin Foley (Sports Without Balls) and more! This event, like all Satellite Events is open to all badge types. Select Satellite Events will have a limited number of advance tickets available starting Friday, April 6. Tickets for Satellite Events do not guarantee entry as ticket holders will be admitted after badge holders. If a Satellite Event reaches capacity, single ticket holders will be given a transfer pass that can be used for admission to another Satellite Event that night or to obtain a refund at the Paramount/Stateside Theatre box office. Tickets may be available at the door as capacity allows.